From Ryan Earnhart, CC Lepki, Deadpool, RC Press, and pretty much nobody else, it’s our first full book! If you have ever found yourself at a dinner party struggling to join a lively debate about the latest pop culture phenomenon while simultaneously steering the conversation toward Godly topics, then this is the book for you. Redeeming Culture presents its first ever guide to navigating the tumultuous waters of common party topics such as self-destruction, homicidal mermaids, and mass genocide. Let Deadpool be your role model for what it really means to be a Christian. 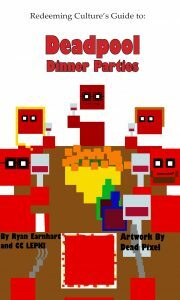 This short book is your all inclusive guide to Deadpool Dinner Parties. Download it now by clicking here! Read what people are(n’t) saying about it! This entry was posted in Marvel and tagged book, breaking the fourth wall, Deadpool, marvel, RC Press, Redeeming Culture Guide. Bookmark the permalink.